Free Shipping Included! 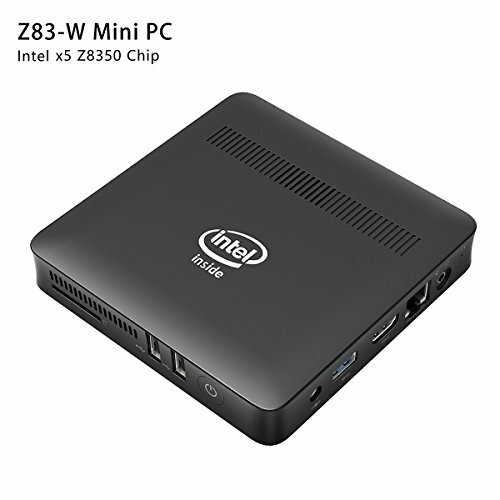 Z83-W Fanless Mini PC Desktop, Windows 10 64-bit Intel x5-Z8350 (Up To 1.92 GHz) HD Graphics, DDR3L 2GB/ 32GB eMMC/ 4K/ 1000M LAN/ 2.4/5.8GHz WiFi/ BT 4.0 [Dual Output - VGA/HDMI] by Plater at Pacs BG. MPN: BOX-Z83-US-Bla-s. Hurry! Limited time offer. Offer valid only while supplies last. 【Wall Mount Included】Packed with IEEE 802.11a/b/g/n 2.4G+5.8G Dual-Band Wi-Fi, Gigabit Ethernet and Bluetooth 4.0, providing substantially improved connectivity capabilities. Included Wall Mount is ideal for hiding the Z83-W behind your TV set, reduce the amount of devices visible in your room, and enjoy comfortable entertainment environment.